Jerry's credentials as an rhythm and blues artist were deepening with every release. Here, he takes on the Motown catalogue with his version of ''Money'', written by Barrett Strong the previous year. In truth, the song was not yet considered a 'classic' when the decision was made for Jerry to record it. Even the Beatles may not yet have discovered it. This Nashville session from September, 1961 is notable in one important way. Never before had Jerry worked with more horn players. The Union logs list six of them which, along with the usual rhythm session, meant that Sun was paying some serious front money for this date. 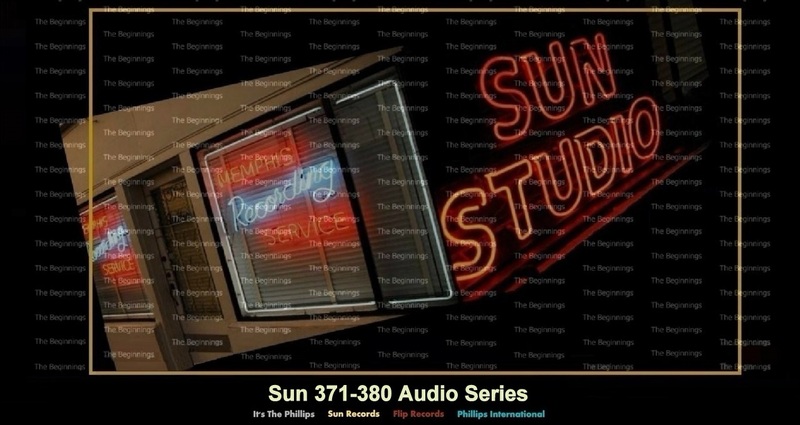 This was Ray Smith's second and final Sun release from his post-rockabilly period. As on ''Travlin' Salesman'', Smith is in his white soul bag here with both sides of this outing. ''Hey Boss Mann'' is the standard working man's complaint. For all intents and purposes, this is a Charlie Rich record. The material, instrumental sound and even vocal are not far from the material Rich would be recorded for RCA within a year or two. "Blue Train" is another matter. This is really vintage Johnny Cash, and must have delighted his legion of fans who lamented the loss of the early Johnny Cash sound. Although early pressings of the record credited the song to Cash, in reality the song wasn't an original. The mistake seems natural enough since composer Billy Smith had done his share of listening to early Cash records. In truth, compared to vintage Cash train songs, this one was a little selfconscious and lyrically awkward in places. Cash's stumbling over the words ("as half as bad") doesn't help matters, but on balance this was more than Cash fans had dared to hope for so long after the departure of their man from Sun in 1958. Luther's four bar solos sandwiched between verses add a nice touch and that steel guitar sound on the intro had pickers scratching their heads. were a barbershop quartet that performed in the 1950s and 1960s. For just about a year, ending with this release in April 1962, Harold Dorman was one of Sun's main stable of artists. Three releases in 11 months suggests that the powers that be saw potential in Dorman's work. They were right. Dorman was a major artist waiting to happen. He deserved far more than his moment of stardom from ''Mountain Of Love''. Every one of his Sun releases, and this is no exception, reveal an inventive spirit, a fine voice, and a real flair for bringing southern feeling to his music, while acknowledging contemporary trends. The playing in ''In The Beginning'' is hot. It's clear that these guys are fired up. The bass work is adventurous; it's all over those changes. And Stax/Hi stalwart Al Jackson's crisply recorded drumming is truly inspired. The guy just can't sit still. Complete with riffing horns by Martin Willis and Vincent Trauth, this is a tight little combo and Dorman responds with a fine vocal. There is enough groaning in his delivery to keep even Conway Twitty happy. If one side of this track below was geared to kiddies, albeit the mellow ones, this side ''How's My Ex Treating You'' was plainly adult fare. The spirit of Marty Robbins and his hits ''Don't Worry'' and ''It's Your World'' loom large over the proceedings here as J. W. Brown and his electric bass growl their way through the arrangement. Even Shirley Sisk, last glimpsed sitting at the organ on Sun 365, supports Jerry Lee on this one. There is a deep bluesy vein to this Vic McAlpin tune, thus laying the groundwork for Jerry's pedigree in the country market for the next several decades. By July 1962, when this record was released, Tony Rossini's name was appearing more frequently on Sun labels than any artist's. This was his fourth record, with yet another in store one year in the future. ''New Girl In Town'' is a commercial outing aimed squarely at the teen market as it sounded nearly four decades ago. Tony plays a high school student trying to con his parents into going away during vacation time so he can be alone with the nymphet in the song's title. Most fans of Sun's golden age will turn a disdainful or deaf ear to this music, rightly arguing that it comes from a different universe than classic recordings by Elvis Presley and Jerry Lee Lewis.